WASHINGTON – The bison has become the official national mammal of the United States under legislation signed into law by President Barack Obama on Monday. Lawmakers spearheading the effort say the once nearly extinct icon deserves the elevated stature because of its economic and cultural significance in the nation’s history. “I hope that in my lifetime, thanks to a broad coalition of ranchers, wildlife advocates and tribal nations, we will see bison return to the prominent place they once occupied in our nation’s shortgrass prairies,” said Democratic Sen. Martin Heinrich of New Mexico, who worked with Republican Sen. John Hoeven of North Dakota to pass the Senate version of the legislation. TWO MEDICINE VALLEY – A river snakes through this valley southeast of Browning like a muddy belt on a barren landscape. This corner of the Blackfeet Indian Reservation is relatively unchanged from when the nearby hills were shaped several millennia ago, a time when millions of bison roamed the Great Plains. The bison have long been a crucial species for the Blackfeet, but more than a century ago they were wiped off this landscape at the hands of white settlers. Now, the Blackfeet Nation is leading an international effort to return these iconic animals to the Rocky Mountain Front. 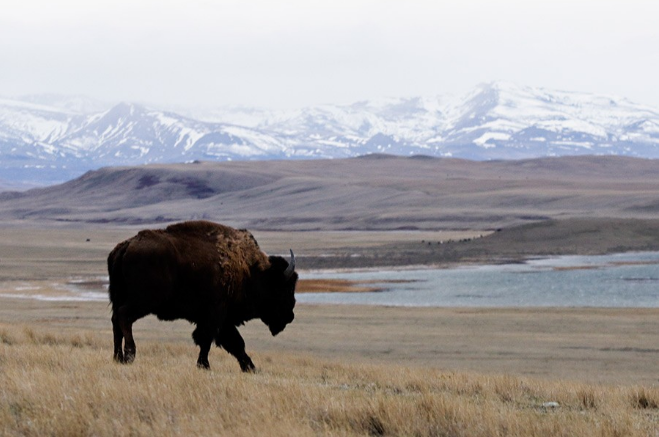 Last week, those efforts took a giant leap forward in this small valley on the Blackfeet Reservation with the arrival of 88 young bison that will form the core of a herd tribal officials hope will one day roam freely on their native land. But those plans could be stifled as the animals have become a source of controversy in the state and as communities debate the implications of bison reintroduction.